Rocket USA has a second Simpsons item out this month, hot on the heels of the Homer Wind Up. Remeber those cool Jack-in-the-box toys you had as a kid? 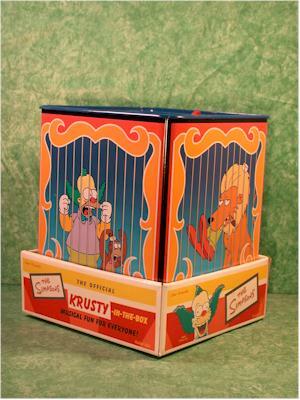 Well, here's Krusty in a Box! It's the same theory, but with our favorite demented clown. It looks like we'll see quite a few more tin based toys coming out under the Simpsons license this year, many of them really imaginative. I believe the word 'minimalist' applies nicely here. There's not much to the packaging, but there doesn't need to be. The toy speaks for itself, and by only placing a box around the base, they give you complete freedom to try it out in the store. 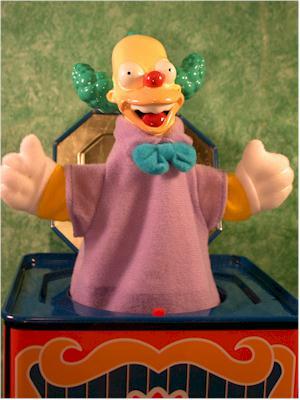 It's Krusty - not a perfect Krusty, but a passable one. It's hard to completely mess up cartoon characters, with the less detail that's natural to the medium. But this sculpt only gets is close enough to keep you satisfied, without reaching perfection. The head may appear small, but that's due to the style of toy. Scale isn't really the goal here, and the cloth body and hands are baggy and oversized, making the head appear incorrect. This type of toy is supposed to have that sort of cartoonish appearance, even for a cartoon character. 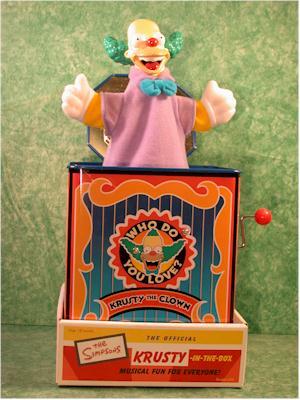 I'm giving two scores here, since the paint work and methods on the head of Krusty and the tin box itself are very different. 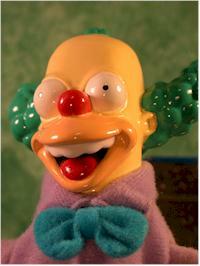 Krusty's head and face have a bit of slop, with some gloppy spots (that's a technical term!) and less than perfect lines between the colors. The paint is fairly thick too, and overall his face is again acceptable, but less than perfect. Now the tin - wow! I've always love lithographed tin, and I'm continuously amazed at how wonderful it can look when done right. The colors are bright and vibrant, the details terrific, and there's no doubt about the high quality. I've heard of some folks having problems with the mechanical feature of the box. Either the lid wouldn't stay shut or the the mechanism wasn't working well. I'm happy to say that mine has no problems at all. 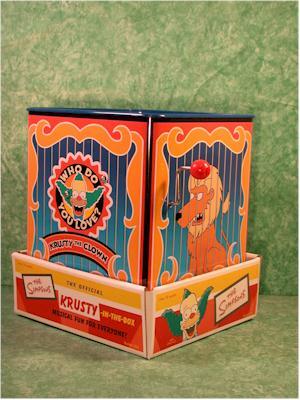 The box stays shut without any effort, and Krusty pops up cleanly every time. The only issue I have here is the song. They play 'Pop Goes the Weasel', the standard Jack-in-the- box tune. I think they missed a great opportunity where they could have used something more associated with the show. This is a tough call - tin toys aren't cheap. But at $20-$25 I think we're a little too high. If you can find him for under $20, this score would go up. Krusty is a solid three. If they'd given us a more imaginative tune, or the price was another 20% lower, they score could have improved. Still, he's a neat item for any Simpsons collection, and I'm glad I picked one up. - The best price I found was at Comics Infinity, for $19.55 plus shipping. Customer service is always tops with them as well! Look under the New Toys, Simpsons section. - Warped Evolution has a terrific price at $20 plus shipping. I've never ordered from them, but the owner is a regular at the Simpsons Collector Sector. - Grants Toys is where I picked up mine. They have the for $25 plus shipping, and I've always gotten great customer service.